The UN’s Convention on Biological Diversity hasn’t yet developed a mechanism for channeling money to biodiversity hot spots the way the Climate Change Convention does for carbon, but a new initiative called LifeWeb is providing market-like transparency for environmental aid and funneling millions to biodiversity hotspots based on the ecosystem services they provide. The UN’s Convention on Biological Diversity hasn’t yet developed a mechanism for channeling money to biodiversity hot spots the way the Framework Convention on Climate Change does for carbon emissions, but a new initiative called LifeWeb is providing market-like transparency for environmental aid and funneling millions to biodiversity hotspots based on the ecosystem services they provide. Click to hear EXPANDED COVERAGE of LifeWeb in this EM podcast. 21 May 2010 | NAIROBI | For more than a decade, authorities in Mozambique, Zimbabwe, and South Africa have been trying to piece together the Great Limpopo Transfrontier Park – a 35,000-square-hectare “peace park” linking separate wildlife refuges spread across the three countries. Living betwen the parks, however, are people; and Gladman Chibememe fears they may get the short end of the stick. He believes that both people and animals will come out ahead if the local economy adapts to the park’s existence, and he’s come up with a plan to jump-start that economy – beginning with investments in ecotourism infrastructure. Now he’s looking for donors to help him get the ball rolling. That’s where Jason Spensley comes in. “Think of us as matchmakers and wedding planners,” says Spensley, who runs the Convention on Biodiversity’s (CBD) LifeWeb initiative. 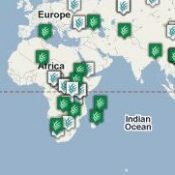 Spearheaded by the German government and launched two years ago in Bonn, LifeWeb strengthens financing for land on the UN’s List of Protected Areas to conserve biodiversity, secure livelihoods and address climate change by making it easy for developers of biodiversity projects and donors to find each other. Since then, it has begun to pay off. Germany alone has already funded roughly 40 projects to the tune of 80 million euros through the platform, while projects in Tanzania, Costa Rica, Cambodia, and elsewhere have all used it to raise money. The platform is patterned after those developed in the voluntary carbon market. Like them, it lets “sellers” of projects (in this case, people who have ideas for preserving biodiversity within areas on the List) post attributes so that “buyers” (in this case, donors with specific environmental goals) can search by criteria in a way that is simple and easy. “We have already designed our document for the expression of interest … and supplied all of the relevant documentation that is needed,” says Chibememe, referring to a LifeWeb page that tells the project’s story and then lists the ecosystem services it provides. Now, he’s waiting for people like Marina von Weissenberg to see the page and respond. “We are supporting a project in Tanzania, and that project was found through this platform,” says von Weissenberg, who is Environment Councilor for the Finnish Ministry of the Environment. CBD Executive Secretary Ahmed Djoghlaf sees LifeWeb as a tool that could help answer the CBD’s lingering question of who how to go about financing biodiversity programs. Nicola Breier agrees. She’s runs the German Environment Ministry’s International Conservation Unit and has backed the initiative from the start. The CBD’s Decision IX/18 on Protected Areas welcomed the efforts of the LifeWeb Initiative and noted the opportunities Parties and other organizations have to participate in this Initiative. So far, LifeWeb has three committed donors, namely, Spain, Germany and Finland with more, like Canada, the EU supporting to join. The government of Spain for example, has committed €5 million to support the implementation of the Convention’s Programme of Work on Protected Areas in 2010-11. In June, 2009, a Coordination Office was established at the Secretariat to manage a web-based information clearing-house to profile protected area needs articulated by Contracting Parties to the CBD as well as indigenous and local communities. It was also meant to strengthen the LifeWeb donor base to support these needs and help facilitate funding partnerships among donors and recipients. All financial support provided in association with LifeWeb is monitored by the CBD Secretariat. Donor commitment and innovation is actively profiled by the Secretariat and other international forums. In order to provide international guidance and inform policy debate, experience gained from concrete projects implemented in association with the LifeWeb will be drawn from. The next step is to link LifeWeb with the carbon and biodiversity atlas, which is a global effort to map complementary biodiversity and carbon values. Sponsored by the United Nations Environment Programme’s World Conservation Monitoring Centre (UNEP WCMC), the atlas is designed to help individual nations understand the value of potential co-benefits under an emerging REDD-plus regime. Henry Herman contributed to this report. He can be reached at neondohenry@yahoo.com.